Facebook/Pam MedinaNurse Sara Putnam, left, embraces coworker Pam Medina. It takes a village to raise a child. Sometimes you just have to ask that village for a little extra help. 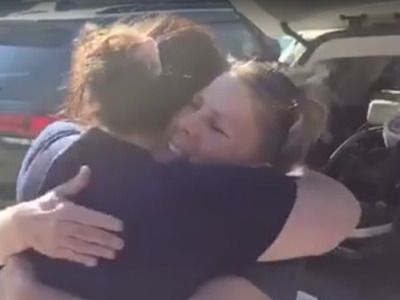 That’s what Virginia woman Pam Medina did when she noticed her coworker, Sara Putnam, in need of baby supplies. Putnam had unexpectedly been granted custody of her weeks-old granddaughter, WTVR reports, and Medina found Putnam looking through a box of donated baby clothes at Henrico Doctor’s Hospital, where both women work as nurses. So Medina decided to ask the community for help, posting requests for donations on local parenting Facebook groups. The response was so great that she didn’t even have space in her car to pick up every donation offered. She fill led the car with clothes, bottles, two strollers, a baby swing set, and more, and drove to the hospital to surprise Putnam. Even today, i am still overwhelmed thinking about the generosity of all the mums on shortpump yardsale and shortpump mums classified that made this possible❤️??? ?